Farrar, Straus and Giroux, 9780374529383, 352pp. The Fixer is the winner of the 1967 National Book Award for Fiction and the 1967 Pulitzer Prize for Fiction. 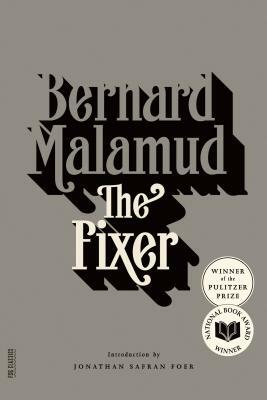 The Fixer (1966) is Bernard Malamud's best-known and most acclaimed novel -- one that makes manifest his roots in Russian fiction, especially that of Isaac Babel. Set in Kiev in 1911 during a period of heightened anti-Semitism, the novel tells the story of Yakov Bok, a Jewish handyman blamed for the brutal murder of a young Russian boy. Bok leaves his village to try his luck in Kiev, and after denying his Jewish identity, finds himself working for a member of the anti-Semitic Black Hundreds Society. When the boy is found nearly drained of blood in a cave, the Black Hundreds accuse the Jews of ritual murder. Arrested and imprisoned, Bok refuses to confess to a crime that he did not commit. Bernard Malamud (1914–86) wrote eight novels; he won the Pulitzer Prize and a National Book Award for The Fixer, and the National Book Award for The Magic Barrel. Born in Brooklyn, he taught for many years at Bennington College in Vermont. Jonathan Safran Foer is the author of two bestselling, award-winning novels, Everything Is Illuminated and Extremely Loud and Incredibly Close, and a bestselling work of nonfiction, Eating Animals. He lives in Brooklyn, New York.